trying to increase knowledge and involvement from audiences other than children and their parents, this information can help you with your goals. Spend some time learning unique needs and concerns of your sub-population. Discover what obstacles prevent or hinder this group from using child passenger restraints. Find where to get information that your audience needs to know. Develop a tailored presentation or training program targeting your subgroup. Develop or find tools and media to help get information to your audience. How to identify resources for your subgroup to get help with installing, selecting, and/or purchasing child safety seats. They could not afford to purchase safety seats. Parents did not leave safety seats with their children when the child was riding with someone else. They did not know what seat is best for each child’s size and age. They were not able to install correctly due to lack of mobility or strength. They didn’t know the correct way to install each seat into different vehicles. They didn’t know the laws and recommendations for child passenger safety. They weren’t sure where to go for help. Have more people from different fields and departments in your organization, company, or community get certified as CPS Techs. Speak with the different organizations in an effort promote policies or a systems that engage and inform non-parent drivers and the parents too. Push for enforcement. Work with the police department to make sure that child safety seat use is a priority. Get involved in the follow through. Talk with your local police department, and see how they are cracking down and enforcing the laws of safety seats. Find out what they are doing with the fines they collect for tickets. Suggest that first time offenders can take a course in child safety seat laws and recommendations, instead of getting fined. Then, with the fines they do collect, use a percent of the money to purchase seats that can be given to those in need (not just parents but non-parent drivers as well). 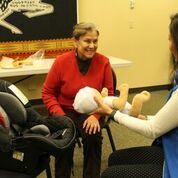 Set up car seat clinics in the community. Talk with your local fire departments and police departments. Having the proper training tool to demonstrate how children should be properly secured in a car seat can reduce the risk of death and injury and increase the number of children’s lives saved. Handmade dolls or commercial dolls may be used if they meet car seat height requirements. Examples of commercial dolls for CPS Tech use are Huggable Images’ car seat safety training dolls . These dolls are specifically designed for CPS training. They are a cost effective solution for Child Passenger Safety training. They are easily transported, given the largest doll weighs less than 10 lbs. Their firm torsos won’t collapse during seat belt demonstrations. They have varied skin tones to represent diverse ethnicities. Dolls are fully customized for your specific needs. Demonstration kits come equipped a variety of safety belt types found in most cars Kits typically include 3 types of belt retractors, different types of latch plates, and practice belt webbing. These kits give class participants hands on practice with the safety belt systems that might occur in different vehicles. Safety2Go, provides demonstration kits for CPS Techs. 6. Technician toolkit (Facebook link). To learn about car safety seat distribution in your community, go to the next module.